English linguistics will be a possible area of specialization (“Schwerpunkt”) within the BA Empirische Sprachwissenschaft from October 2017 (WiSe 17/18) on. This module consists of a singele course. In this course, you will get a good overview of the central phenomena and constructions of English. This is a two-semester module in which you will learn the basis of a formal, theoretical syntactic analysis of English. The “Modulprüfung” will be a term paper of 8-12 pages in the second semester. This is a two-semester module in which you will expand the knowledge of semantics that you have gained in your module K6.1. You will participate in two advanced semantics courses offered at the IEAS. The “Modulprüfung” will be a term paper of 8-12 pages in the second semester. This module consists of two submodules which can be freely chosen among the verious seminars offered at IEAS/Linguistics. For Externes Nebenfach (6 CP): just like BA English Studies 3.4.2. This module (6 CP) allows you to get a deeper knowledge of two chosen areas of linguistics. You should contact one of the lecturers from IEAS/Linguistics to agree on a set of texts. You will write short summaries on these texts and, if you do the Modulprüfung in linguistics, there will be a 30 minute discussion on the texts. 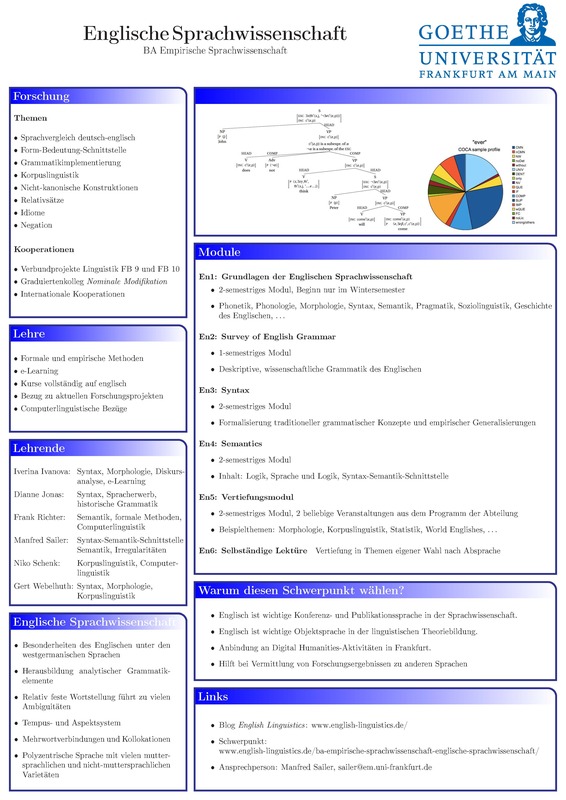 General inforamtion on the BA Empirische Sprachwissenschaft: http://www.uni-frankfurt.de/43482300/bachelor-es?